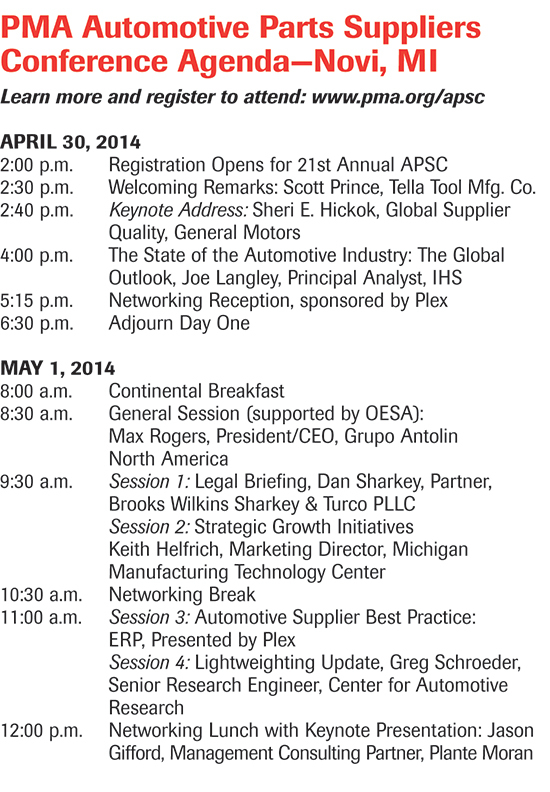 At the Precision Metalforming Association’s upcoming 21st annual Automotive Parts Suppliers Conference (APSC), April 30-May 1, 2014, industry executives will gain a huge dose of what it will take for the metalforming-industry supply base to grow much-needed capacity. And, many suppliers need to invest in technology to meet increased demand for stronger, lighter parts and assemblies. 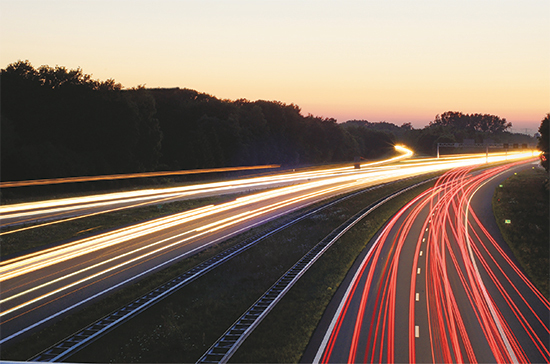 For an up-close look at the supply-chain perspective of one automotive-OEM executive, here we reprint (with permission) a recent article from Automotive Supply Chain magazine. Its editor, Sam Ogle, interviews Chrysler director of supplier relations Sig Huber, who discusses the firm’s World Class Manufacturing initiative with suppliers, its use of a new pre-sourcing strategy and other important and trending topics. Forecasts from the Federal Reserve Board and the Manufacturers Alliance for Productivity predict a 4-percent rise in U.S. production of motor vehicles and parts in both 2014 and 2015. This comes on the heels of a 7-percent uptick in 2013. Growth will continue, the forecast shows, by 2 percent per year in 2016, 2017 and 2018. That would move annual vehicle production to a supply-chain-straining 16.7 million units. Learn more and register to attend this important event, slated for Novi, MI, at www.pma.org/apsc. Last but not least, Women in Manufacturing (WiM) and the Automotive Womens Alliance Foundation (AWAF) jointly will host the 3rd annual Women in Automotive program, collocated with the APSC meeting. It kicks off April 30 at noon; separate registration is required at www.womeninmanufacturing.org. Multiple, simultaneous vehicle launches and the pipelining of hot sellers create manufacturing capacity challenges, but the supply base is highly resilient says Chrysler’s Sig Huber. He spoke with Sam Ogle. The automotive market in the United States is enjoying a period of unforeseen growth following the despondency created by the 2008/2009 recession. Analysts are already predicting a return to pre-downturn sales levels within the next two years. Every silver lining has a cloud, of course, and there have been reports of capacity shortages in the manufacturing supply base. Sig Huber, director of supplier relations at Chrysler Group LLC, believes that the challenge has not been insurmountable. The industry is seeing a plethora of new model launches and these, says Huber, are creating capacity challenges, as is the tendency for OEMs to fill their dealer pipelines with “hot” vehicles for which consumer demand is high. Even if a supplier has planned well it can reach a point where several of its customers are asking for more and more components and the supplier only has so much capacity. Sig Huber joined Chrysler in April 2008 having previously spent nine years with Toyota. His team is responsible for improving supplier and industry relationships, communications and events, supplier risk management, supplier assessments, supplier diversity, contract administration, training and development, audit compliance and various other strategic areas within global sourcing at Chrysler. Huber also oversees the procurement of all parts and services for MOPAR, Chrysler’s aftermarket parts and performance parts division. Huber was actively involved in Chrysler’s restructuring activities in 2008 and 2009 and in that capacity he worked closely with the U.S. Treasury Auto Taskforce and Fiat due diligence and integration teams. The Chrysler purchasing operation is headed by Scott Kunselman, who has several direct reports, notably the commodity directors who purchase parts and services by category. One is responsible for metallic commodities such as chassis parts, one for powertrain, including transmissions and engines purchased from other companies, one for chemical commodities, basically parts made from plastic or rubber such as tyres or spoilers. Another has responsibility for electrical components including navigation systems, radios and computers and there is also a director responsible for indirect materials such as products used in Chrysler’s plants including lubricants and protective wear. This latter category also includes services such as IT, consulting, advertising and capital equipment. The Chrysler purchasing operation was one of the first groups to integrate globally following the acquisition by Fiat in 2009. Some of the commodity directors are global leads for their category and could be located either in Europe, Latin America or the United States. The chemical director, for example, is the global lead for chemical around the world and all the chemical buyers globally report through him. “There is a global head of purchasing for Fiat/Chrysler, who is Scott Garberdine,” explains Huber. 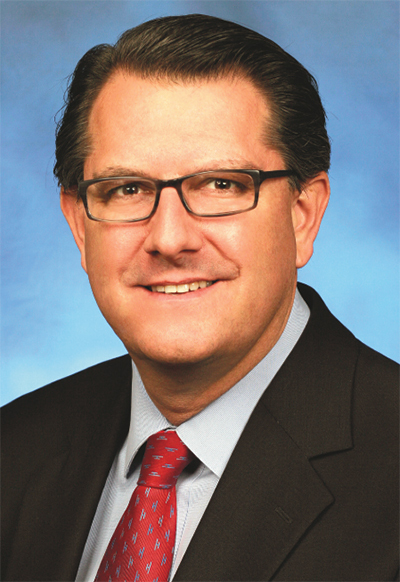 “He is the global lead and Scott Kunselman is the Chrysler lead. Each of the global directors is in a matrix organization and wears a global hat to report to Scott Garberdine and a regional hat to report to whoever their regional head of purchasing is. For example, the global chemical lead is located in the United States but, depending on the commodity, the senior manager under him could be located in Latin America. The lead buyer for a commodity, oil for example, could be located in Europe. “These groups at the commodity level are completely integrated globally; they have their own staff meetings and their own sourcing tables. We started this process several years ago and it is well-established and gives us a lot of ability to create common global strategies for our suppliers and for commodities. One of the concepts that Chrysler has really embraced since the Fiat acquisition is World Class Manufacturing, Fiat’s production system, which is similar in some s to the Toyota Production System with its emphasis on waste elimination and continuous improvement. OEMs will als hope to ensure that their suppliers are bringing innovation to them before they bring it to anyone else. One of the chief complaints from the supplier side, however, concerns the length of time it can take before the OEM evaluates and finally decides whether or not to implement the new idea. According to Huber, Chrysler has accelerated the process. “We have developed a system by which suppliers can submit innovations to us through the purchasing department. Before, it might have been a little bit of a convoluted process for suppliers to know how to bring our attention to their innovations and so we created what is basically a funnel through purchasing where suppliers can submit their ideas and, very quickly, there is a purchasing and engineering taskforce that reviews them and responds promptly with a yes or no answer. If we are interested, it will lead to a presentation by that supplier to a group of our senior vice presidents with responsibility for product development, engineering and purchasing. It is a really interesting and unique opportunity for suppliers to get their ideas accepted through this portal. One of the attributes that Chrysler expects from its suppliers is that they abide by what the automaker calls its foundational principles. These include factors such as transparency, acting with a sense of urgency, commitment to a long-term relationship, acting with integrity and being advocates for Chrysler. With a selected number of suppliers Chrysler has initiated a process called pre-sourcing. Basically, this is a non-competitive bid situation where the OEM starts working with the supplier very early in the development stage of a project and they jointly develop parts and the target pricing for them as the project moves along. According to Huber, this requires a tremendous amount of trust on both sides. Ford Motor Company’s new purchasing head, Hau Thai-Tang, recently announced a targeted reduction of 40 percent in the company’s ranks of suppliers and Ford is not the only OEM to be thinking along these lines. Huber, however, refutes the suggestion that Chrysler has such a specific target. Chrysler speaks frequently to its supply base about a concept it calls meritocracy, something that is also important within the automaker’s internal culture. It is important to understand that all OEMs spend the large majority of their purchasing budgets with the top 100 or so companies in their supply base. In Chrysler’s case, that means that only around 10 percent of its annual spend is spread amongst roughly 1150 companies. Yet those suppliers have to be managed and that takes a lot of resources. “What will happen over time in all the car companies is that those suppliers that are in the tail, especially the tip of the tail, will see their business awarded to those companies higher up in the value stream which have performed well,” says Huber. “We have many factors that determine our choice of suppliers in any particular case. The most important is supplier commodity strategies. Once the suppliers start looking at the business, our engineering teams and our supplier quality team create criteria to analyse the suppliers and rate them in terms of technical competence and plant readiness. We also consider their scorecard performance over the past year or so and we even look at things such as their supplier diversity performance. We have a very strong program where we encourage our Tier One suppliers to use minority-owned businesses for a certain percentage of their work. Cost is, of course, very important but what’s also important are quality, innovation, technical competence, the design capability and the engineering resources. We have quite a large spreadsheet that we use when we make sourcing decisions. One of Huber’s areas of responsibility is risk management. His group carries out financial reviews of all Chrysler’s production suppliers and its largest indirect suppliers. The other aspect of risk management that has been thrown into focus over the last few years is how to mitigate the potential disruption to supply caused by natural disasters around the world. “There has been increased activity in this area ever since the Japanese tsunami,” says Huber. “People have been trying to figure out how to get better visibility deep into the tiers of the supply chain. We know who our Tier One suppliers are and where all their plants are located and we have a warning system that tells us, if there is a tsunami or tornado or whatever, what Tier One suppliers are in its footprint. Where it gets very murky is in the subtiers. “A lot of industry consultants are trying to figure out how to gain visibility into the subtiers and how to keep that visibility current. It is very difficult as an automaker to know who is down there in the subtiers, where they are located and to fully comprehend what the risk profile is. This still is very much a work in progress in the industry. 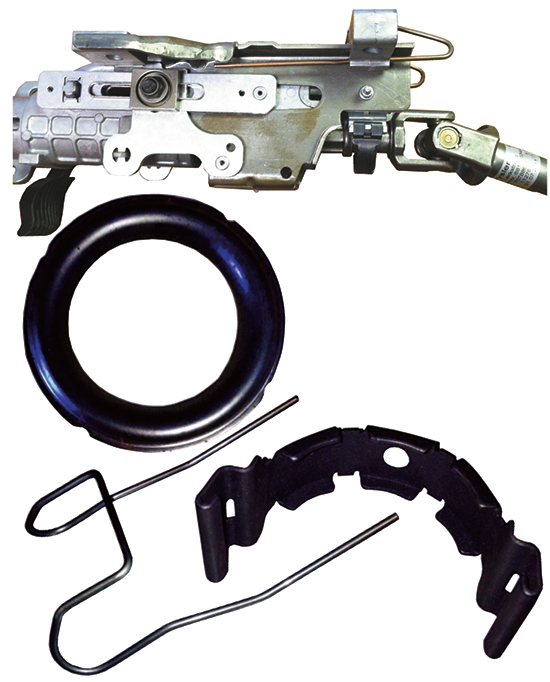 Chrysler supplier Clips and Clamps supplies these parts for the steering column assembly (left) built by Toledo Machining. Chief among the “open-book communications” Olszewski appreciates: Chrysler’s monthly townhall meetings, geared toward Tier One suppliers. These 90-min. sessions allow Chrysler executives, including Kunselman and his department heads, to update the supply chain on new-product developments, changes to supplier scorecards and other topics. Much is made of the supplier scorecards used—and frequently adjusted—by Chrysler and other OEMs. Every 2-3 years it seems suppliers face new measuring sticks. Aznavorian, who sees this as a means preventing complacency amongst suppliers, notes less emphasis on cost-downs in recent years. Instead, scorecard weighting has shifted toward quality measures (PPM etc.) and the ability to meet expedited delivery dates. “This is where transparency and communication really becomes an asset,” Aznavorian says. It’s this type of collaboration and support that makes an automotive supply chain strong, allowing the creation of added capacity without any accompanying quality or safety concerns. And when supply successes occur, kudos from the OEM goes a long toward building morale—also strengthening the supply-chain’s links. For its part, Chrysler has become great at heaping praise onto its suppliers to recognize success, say Aznavorian and Olszewski.